Automate application which build on "Team Developer"
I am beginner for "Team Develop". I want to automate application's controls(Grid,Table,Button..) which build on "Team Develop". Via google found the same question here. Please suggest me how to resolve this error. Is it correct way to use "Team Develop dll in c# for automate? Automate application which build on "Team Develop"
Well, I'm afraid it will be a hell of a task to implement your own tool. Problem is that not all objects can be accessed from outside. Those objects are not default Windows objects. I know there were 3rd party tools in the past which had plugins for Team Developer, but none of them will support the latest TD versions. Here we use a custom build tool (c#) which supports Team Developer applications. This is done using a custom TD interface which can be called from the tool. The interface acts like a bridge between the external test tool and the TD application. The custom interface does the actual access to TD objects from within the process itself. This in-house testtool is is a mix between access default Windows objects and usage of the custom TD interface. Maybe others here know about ways to implement a test tool. I think that it would be better to use a scripting tool like AutoIt. Question: do you have access to the TD sources of the application you need to automate? Are you allowed to create custom stuff in TD to support the C# tool? do you have access to the TD sources of the application you need to automate? : Let me try first with sample code and than will implement with real code. Can you guide me if i want automate below sample application? I need only grid value which are display. My sample application is located below path in my system. let me know how to create bridge between the external test tool and the TD sample application. Can u i create plugin for TD application which can allow to me access TD application UI Control for automation. A way to do this is sending a message to the object within the TD application from the tool instructing the action to perform. At the receiving side, the TD object reads the passed data to perform the action. The result is then put back into a response data object which is then accessible to the tool. Each object should be derived from a base class, which implements all the actions needed. As for other objects with are from a WIndows class, like datafields, sending a WM_GETTEXT to the object will get the contents of the field. Same for clicking them etc etc. As long as the TD object is a "Windows" object, the normal WinAPI messages/functions can act upon it. 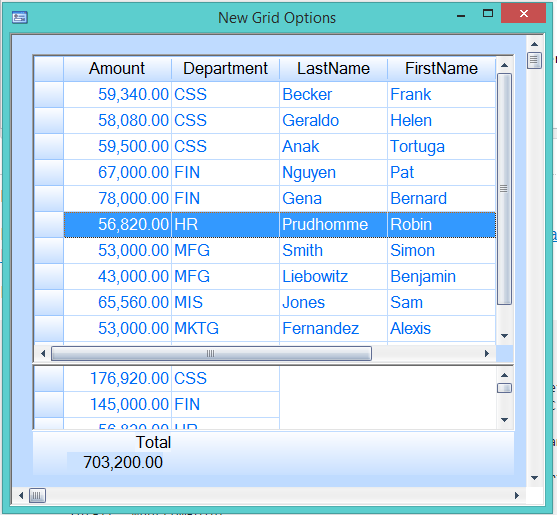 Tables in TD are custom objects and will not be able to be queried or managed from outside. I also made an example for automating a grid. Very simple example but can be extended. Now i want to convert it in .Net or C++ dll. After converting it dll, Can i use in my application? you have to write your C# or C++ program like GridAutomationClient.apt. I am beginner in TD development. Can you help me to convert GridAutomationClient.apt in C# dll. do you have any sample program for C# .dll? I built an equivalent application of the grid client in C# (Visual Studio 2017).